Two of the most significant labour disputes of 2018 might still be taking place on March 8, the day on which the International Women’s Strike steering group in the USA called for all women to stop work – including and especially the socially reproductive work they do for free – and to take over the streets. The first is the strike in the UK against the proposal by Universities UK (UUK – the employers association in UK higher education) to move from the current system of defined benefit pensions to a system of defined contributions under which retirement incomes will depend only on returns from money invested in the stock market. The reform will affect almost 200,000 university staff and it will mean that lecturers will be around £ 10,000 per year worse off once they retire. A strike against the proposal began on February 22nd and has already gone on for six days at the time of writing. Now in its third week, the strike will continue until Thursday March 8 and then resume the following week, until March 16th – unless negotiations change this scenario. The second is the strike by public schools teachers in West Virginia, in the USA, for a pay rise and against the mounting costs associated with the state’s PEIA (Public Employees Insurance Agency), which would more than double the monthly premium teachers have to pay for their health insurance. The strike began on the same day as the strike in the UK – i.e., February 22nd – and in spite of offers of a modest salary increase, teachers are still refusing to resume work until their demands are fully met. Both strikes involve workers in the education sector, and both are concerned with classical union demands: for better wages and better living standards. At a first glance, these two strikes might not seem to have much to do with women as such directly, involving, as they do, people of different genders and demands that are non-straightforwardly gendered. In both cases, however, gender justice and social reproduction are heavily implicated. Under the UUK plans, lecturers and senior lecturers ending their careers at around £48,000 and £58,000 per year respectively, will be the worst off, receiving in the end only around £10,000 per year in pension (a 40% drop as compared to the current scheme). It is worth noting that the majority of lecturers and senior lecturers in the UK are female, in a sector in which men still occupy over 75% of professorial positions. Furthermore, as scholars of elderly care know all too well, cuts to pension and the prolonging of the retirement age affect women in particular. Retired women across the world receive lower benefits than men. In the EU alone, “the poverty rate among elderly women is 37 per cent higher than among men”. Furthermore, women tend to have more career breaks – due to maternity leave and periods of part-time work due to them disproportionally taking on childcare tasks – and to live longer than men on average, thus requiring care for more years in their old age. Women can thus expect to feel the harsh impact of draconian pension reforms in a world in which gender pay gaps and the unequal sexual division of labour affect them in particular. The teachers’ strike in West Virginia needs also to be looked at from the perspective of gender, not only because the large majority of public school teachers are women, but because the grievances to which they are giving voice and the demands they are putting forward have a particular gender inflection. High costs of health insurance tend to impact especially upon low-income women, particularly when they are mothers. The expense associated with pre- and post-natal care does in fact give little choice to poor mothers but to discontinue healthcare use, which can have detrimental effects on their wellbeing. Public school teachers, furthermore, are increasingly required to carry out tasks for which they are not trained, nor paid for, such as providing emotional support for children and listening to families’ wants and needs. It is not by chance that they are effectively called upon to perform this type of “emotional” labour. The fact that they are mostly women doing work that heavily involves affectivity and caring carries with it the assumption that educational labour can be seen as an extension of the unpaid reproductive work women do at home, and thus, aspects of it do not need to be paid. And knowing all too well the reproductive implications of their work, West Virginia teachers packed lunch boxes and organised meals through churches and communities before they went on strike, to make sure children from the poorest families could still have food guaranteed during the schools’ closure. To be sure, these strikes are occurring in two very different national contexts – the UK and the USA – and yet, they have a common feature and a common cause: on the one hand, both universities and public schools have been sites of the so-called feminization of labour, which means that the poor labour conditions once reserved for typically women’s jobs now apply to those labour sectors as a whole (in terms of wage stagnation, growth of part-time, precarious contracts, and so forth). On the other hand, the higher and public education sectors in both countries have been subjected to a brutal neoliberal assault brought about by the corporate reconfiguration of schools and universities as factories churning out the future, low-pay, precarious laborers in the making. Once again, both processes – the feminization of labour and the neoliberal restructuring of education – are profoundly gendered not only because they affect women in particular (who are the majority of junior university staff in the UK and the majority of public school teachers in the USA) along the lines I briefly traced above, but also because they speak of the crisis of social reproduction. Universities and schools are socially reproductive agencies by default: they train and guarantee the supply of the future labour force for capitalists. But while capital accumulation cannot do without social reproduction, capitalists do not want to bear its costs. That is why, in a context in which states are following the neoliberal dictates of privatisation and cutting on public expenditures, households (and especially women within them) still do a large part of socially reproductive work for free; that is why commodified care jobs (nannies, domestic workers, nurses) are under-paid and socially devalued. That is also why universities and schools’ staff are under constant attack. Against this background, the ever more likely temporal coincidence of these two strikes on March 8 acquires even more significance. Since 2017 women all over the world have chosen to mark March 8 not as a day of historical “celebration”, but as a day of struggle. In Poland, Argentina, Italy, UK, USA and many other countries, on this day women have decided to withdraw their labour (be it the waged labour they do for a living, or the emotional and material free labour they do to reproduce their families) to protest against gender oppression in its many forms and to show what it would mean for society at large if women stopped working. Labour rights and full social provisioning are among the main demands of the movement, for we recognize all too well that inequalities and the dismantling of the welfare state have a disproportionate impact on women. On the other hand, university lecturers and public school teachers have an interest in linking their struggles with the IWS’ demands for gender, labour and social justice. 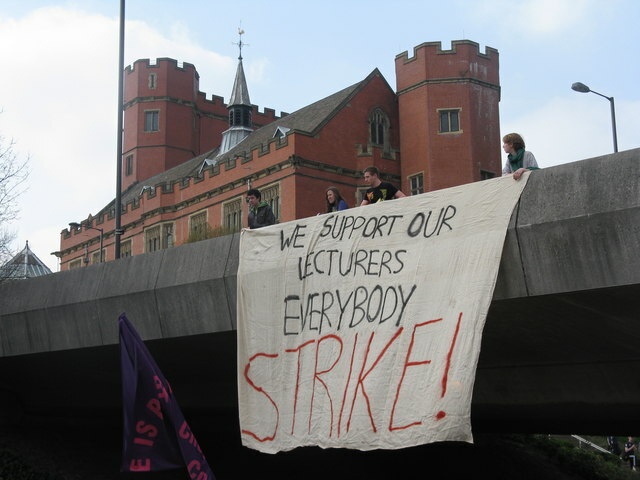 To acknowledge that the attack against their pensions and their wages is an attack on women is not to disavow the ways in which it affect others, but to emphasise that the neoliberal capitalism’s attempt to abash the socially reproductive labour of lecturers and teachers goes hand in hand with its deprecation for those activities that do not bring ready-made profit. Women have been historically at the centre of these activities that capitalism demeans. That is why, the struggle for gender justice has always been and remains today crucial for the struggle for labour and social justice in general. Sara R. Farris is the author of In the Name of Women’s Rights. The Rise of Femonationalism, Duke University Press, 2017.